Members of the Virginia House of Delegates’ Agriculture, Chesapeake, and Natural Resource committee met with researchers on the Virginia Institute of Marine Science’s Gloucester Point campus last week to discuss water quality, clams, oysters, blue crabs, and more. Each a member of the larger body’s Chesapeake Subcommittee, the visiting delegates share an interest in restoring and maintaining Chesapeake Bay’s ecological and economic health. Delegate Tony Wilt—who represents Virginia’s 26th district including the City of Harrisonburg and part of Rockingham County—invited the group for the 2-day retreat, which started on Wednesday at Bevans Oyster Company in Kinsale with the legislators arriving at VIMS that evening. Wilt chairs the subcommittee. The other visiting delegates were Robert Bloxom (R-100th), Danny Marshall (R-14th), and Lee Ware (R-65th). VIMS Dean and Director John Wells kicked off Thursday’s activities with an overview of VIMS and current issues affecting the Bay, followed by a discussion focusing on clams and oysters on Virginia’s Eastern Shore led by Michael Oesterling, Executive Director of the Shellfish Growers of Virginia. 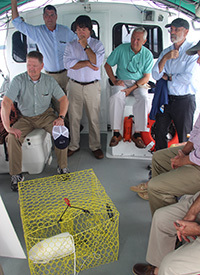 During the campus tour, subcommittee members took a cruise aboard the R/V Bay Eagle where they discussed water-quality monitoring, microbeads, and the use of biodegradable panels to reduce by-catch in abandoned crab pots with Willy Reay, Director of the Chesapeake Bay National Estuarine Research Reserve, and Kirk Havens, Assistant Director of the Center for Coastal Resources Management. Their visit also included a stop at the oyster hatchery, where they continued the discussion on oyster aquaculture with Stan Allen, Director of VIMS’ Aquaculture Genetics and Breeding Technology Center, as well as visits to several laboratories on campus. In addition to their discussion with VIMS researchers, subcommittee members explored some of the Bay’s living resources with the Chesapeake Bay Foundation aboard the CBF vessel Jenny S, including a visit to a York River oyster sanctuary reef, an overview of CBF’s environmental education and restoration program, and a discussion on the economic impact of a restored Bay.